Empire. It makes it easy for you to put your patients in touch with community resources 24/7. 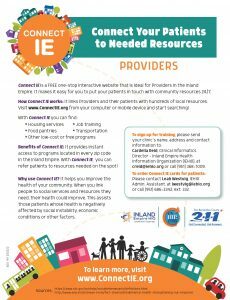 How Connect IE works: It links Providers and their patients with hundreds of local resources. Visit www.ConnectIE.org from your computer or mobile device and start searching!